INNER TOOB: DE-ZONKING "DOOGIE HOWSER, M.D." But with an output like that, sometimes I fear I won't have enough "grist for the mill" so to speak, even with 70 years worth of TV output to work with. So I'm always happy when you, Team Toobworld, send me something to inspire a post. Something unrelated but it suggested an alternate Toobworld (which you may already have), so thought I'd share with you. PERFECT STRANGERS referenced DOOGIE HOWSER, as in a show on TV... by saying an FBI agent (you know how they always show up for hijinks) looks like "the neighbor on DOOGIE HOWSER." Except in our world, there *was* no neighbor on DOOGIE HOWSER. They may have written the bit and inserted a show title later, and it just happened to be one of the shows of its time with no neighbor as a regular or recurring character. Except in the universe of STRANGERS (and the shows it spun-off or crossed over with). As the Ninth Incarnation of the Doctor would say, "Fantastic!" When it comes to TV characters having TV shows made about them, it is a bit of a stretch sometimes, but hey - if it was a concept that was good enough to get its own TV show in the Trueniverse, than it's good enough for Toobworld as well. At least with 'Doogie Howser, MD', I think we have an excellent reason to have a TV show made - a kid who becomes a licensed doctor. And that TV series was made probably as soon as Doogie got his medical license, since – according to ‘The Goldbergs’ – it began airing in 1980-something. 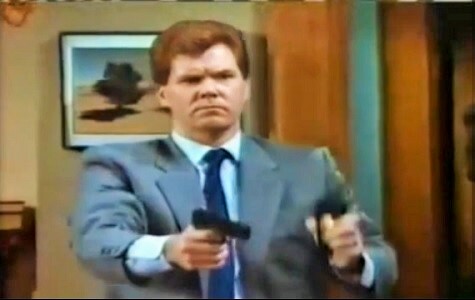 ‘Doogie Howser, MD’ clips are shown in the episode. One would almost except to see the series Doogie Howser M.D. in the credits of actor Richard Hoyt-Miller after Balki comments that he looks like the neighbor from that series and the audience reacts so strongly. But in fact that joke was written before the role was even cast and his name is not listed in that series at all. He has appeared in many other series, such as Falcon Crest, Hill Street Blues, Highway to Heaven, Murder, She Wrote and more recently The Bold and the Beautiful. A child surgeon is called Loogie by Christine. Parker says, "I'll bet Doogie Howser never went through this!" Parker types his final thoughts in his computer journal and says, "Hey, it works for Doogie." Screech says: "Zack's even smarter than Doogie Howser." Doogie Howser appears in Roseanne's dream. When he tries to get into the Alpha meeting Bud gives his name as "Howser, Doogie Howser". Billy says, "Move over, Doogie Howser". Screech says: "I really look like Doogie Howser." As her brother Chris is the youngest heart surgeon in the history of Wisconsin General, Caroline refers to him as 'Doogie Duffy, M.D.'. To Devon's irritation, Vic's nickname for him is "Doogie." To a young looking doctor, Phoebe says, "shhh, Doogie, shhh" and makes him leave the room in tears. Dean confuses Tommy with Doogie Howser. Dr. Cox refers to J.D. as "Doogie." Luke says, "Doogie Howser was a doctor 16." Willow mentions Doogie Howser fan fic. Lorelai calls one of Rory's dormmates "Doogie." Reed: You're like a Doogie Howser meets Gordon Gekko. When Jess finds out that Rory is not at Yale, he assumes she has graduated early and calls her "Doogie." Hodges refers to Marlon as Doogie Howser. Shawn calls a kid Doogie. Raj's parents want to hang up from their web-cast because it's time for Doogie Howser to air, and they don’t want to miss it. Then Leonard, Sheldon, and Wolowitz discuss why Doogie Howser might be so popular in India. 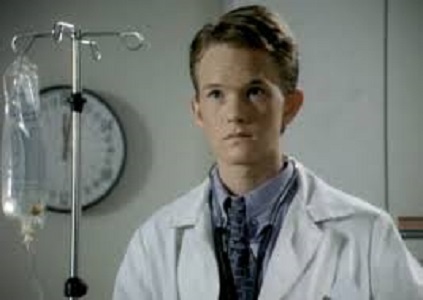 Shawn introduces himself as Dr. Howser, the title character played by Neil Patrick Harris. Troy refers to Jeff as "Dr. Doogie Seacrest." Dr. Habib mentions the title character. Joy calls Lloyd "Doogie Howser". Damon Salvatore tells Elena Gilbert over the phone, "that's what Doogie says," referring to Dr. Wes Maxfield when she asks him if Jesse feeds on vampires. O'Bservation: I'm not sure if this show and its spin-off 'The Originals' belong in Earth Prime-Time. I do have a vampire-infested Toobworld - Nosferatoob - because 'Being Human' and 'True Blood' became too entrenched into everyday life of their world to remain in the main Toobworld. Paris refers to one of her clients as "Doogie Howser." Barry wants to go to medical school and be like Doogie Howser. And then there were all the mentions by the Bots on the Satellite of Love as they watched the following movies…..
Tom: "Never fear! Doogie Howser is here." Tom: "That's Doogie Howser, all grown up." Joel: "Last time he made me watch 'Doogie Howser.''" Crow: "Who am I, Doogie Howser?!" All of those entries were supplied by the IMDb. That was a long list! And that’s after I excised the talk show mentions and references in reality competition shows, animation (‘The Simpsons’, ‘Rugrats’) and series which were set in other TV dimensions (‘Veep’, ‘Castle’, ‘Shameless’). So thank you, Andrew, for giving me another day’s grace in maintaining the blog!